How does UA Performance Mouthwear differ from mouthguards? Technology, does more: It enhances performance. It is not only backed by some of the biggest names in pro sports; it's recommended by dentists, pro trainers, strength coaches and wellness experts. Who should use UA Performance Mouthwear? Hundreds of professional athletes are currently relying on the superior performance and protection benefits of UA Performance Mouthwear. 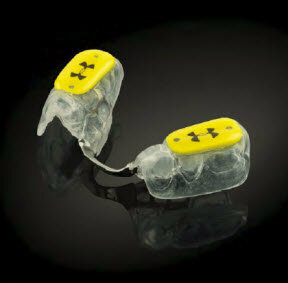 But it isn't just for pros - UA Performance Mouthwear is for all athletes who want to excel in their sport or activity. How do I choose the right product? The UA Performance Mouthguard offers superior protection in addition to its performance benefits and should be used in contact sports such as football, hockey and lacrosse. The UA Performance Mouthpieces are appropriate for non-contact and limited-contact sports such as running, soccer, baseball, golf, tennis and training. How long does it take to get a custom piece of UA Performance Mouthwear? Once fitted, the orders typically take 10 days for delivery. Speak with Dr. Test about shipping options. Dr. Schnierow is a general, children's, family and multi-specialty dentist in Hawthorne who welcomes new patients from anywhere in the Los Angeles South Bay including Hawthorne, Inglewood, Lennox, Gardena, Redondo Beach, Manhattan Beach, Culver City, Carson, Compton, and the Greater Los Angeles Area. Dr. Schnierow's Hawthorne offices have staff specialists in braces (orthodontist), gum disease (periodontist), root canals (endodontist), oral surgery, and children's dentistry. His Hawthorne offices provide dental services for both children and adults, such as braces, dentures, crowns, bridges, porcelain veneers, porcelain fillings, dental implants, teeth whitening, oral surgery, root canal therapy, dental check-ups, and teeth cleaning.